I couldn't wait any longer to try out my new kitchen tools and utensils, and after a week-long venture of grocery shopping, unpacking, and getting situated I was finally able to make something delicious and fun. Nick chose biscotti, so I dug up my mom's recipe and went to baking. Don't judge a book by it's cover, because although I'm a bit of a messy chef, the presentation of the biscotti doesn't do it justice!! It'll be great as a desert, snack, or side treat with morning coffee! Preheat the oven to 350*. Combine first 3 ingredients - beat until light and creamy. Add eggs, one at a time beating until blended. Combine flour and next 3 ingredients - add to butter mix. Stir until blended. Fold in nuts and chocolate. Divide mixture in half; shape each into a 10" x 2" log on a lightly greased baking sheet. Bake at 350* for 25 minutes; let cool on a wire rack for 5 minutes. Cut diagonally with serrated knife using gentle sawing motion. Place biscotti on side on ungreased cookie sheets. Bake at 350* for 10 minutes. Turn biscotti over and back on the other side for the same time. Optional: Between baking biscotti on one side and turning over, begin to bring water to a boil. Once water begins to boil, reduce heat and place a glass or stainless steel bowl on top of the pan with the remaining chocolate chips. Stir constantly until chocolate chips are fully melted. 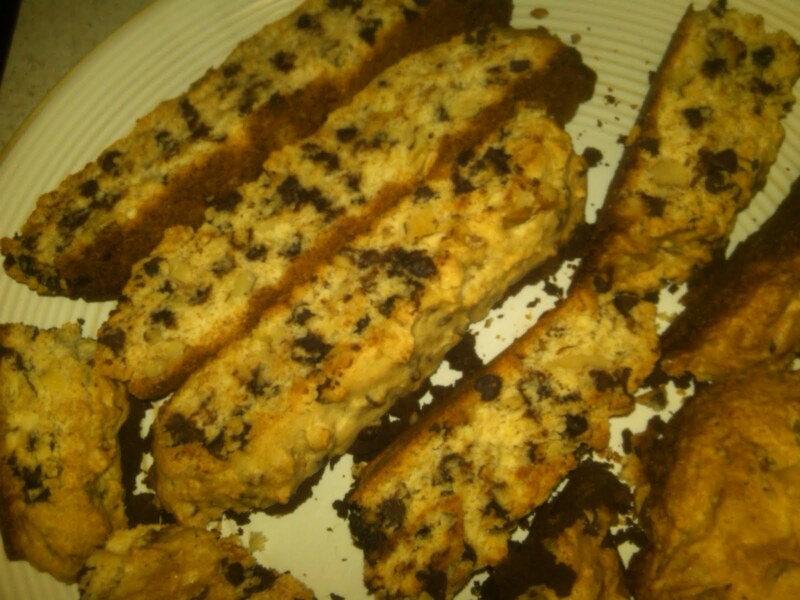 After cooling biscotti, dip into the chocolate and enjoy! Thanks for sharing these great recipes. I saw biscotti and started clicking and checked out your blog. It is amazing!! Love you sweetie and hope you are slowing feeling settled in your new place!! !